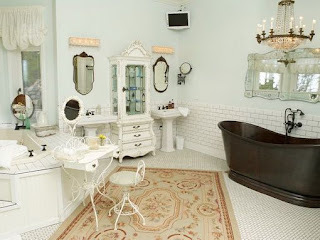 My guest blogger, Diana Smith is back with some interesting ideas on achieving an eclectic bathroom. There is no denying that one of the main lures of the eclectic style lies in the challenge of creating something unified and harmonic out of the pieces that should, otherwise, never been put together. 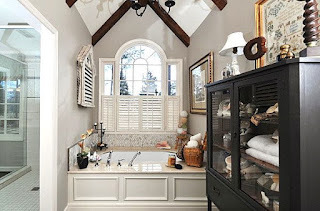 But is it really possible to do such thing in a bathroom where you do not have too much pieces to begin with and virtually nothing to balance the more out-there elements out? Absolutely, as long as you are creative enough. 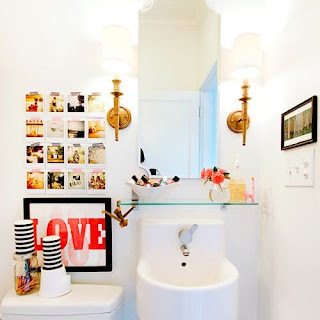 So, it is not the time give up your dreams of having an eclectic bathroom just yet - Here are few ideas that should get your design fix fixed. If you have enough room in the bathroom, why would you not use it to turn this, otherwise, underutilized space in the comfortable and restful retreat where you can spend hours upon hours soaking, reading, and enjoying? All you need to achieve that is a comfortable armchair, small coffee table, and cozy rug. Keep in mind, though, that if you are not going to go for some unified style for the furniture pieces you are going to move in (art-deco, vintage, etc.) 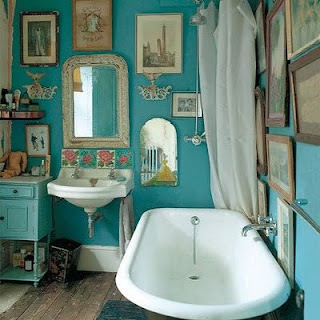 it would be the best idea to paint the entire bathroom (furniture included) in some serene color to connect all of these scattered dots. And now that you have created yourself a pleasant resting room, why would you miss an opportunity to turn your bathroom into a full-blown spa? Introducing plant life just may be the essential move you can make while turning your bathroom eclectic because, while plants can complement virtually any style in existence, they do not belong to either one of them, so there is your odd element right there. It should be mentioned, however, that plants create the strongest effect in the modern and almost sterile-looking environments. As we already mentioned, when it comes to eclectic style, colors are usually used as a connective tissue between various styles and elements, but do not look at this as a rule. If you are not, for whatever reason, able to pursue different styles, you can achieve eclectic look simply by mixing few different hues. Just remember that primary colors should be used, for example, only for cabinets or some other distinct pieces, while all the other wooden elements should be further enhanced by the neutral palette. Otherwise, your good intentions may get lost in too many different hues. Another great way to introduce some change and vibrancy to your bathroom is to simply go for the combination that makes the least sense. Here is an example. Industrial and oriental styles have virtually nothing in common. One is obsessed with futurism, roughness, and minimalism, while other is hopelessly stuck in the past, variegated, and ornamental. 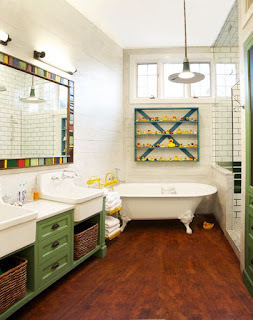 But when you take the most recognizable elements of both of these styles (exposed black pipes, massive pieces, and colorful graphic tiles) and put them together the end result can be magical. Of course, this contrast does not always have to be that jarring. 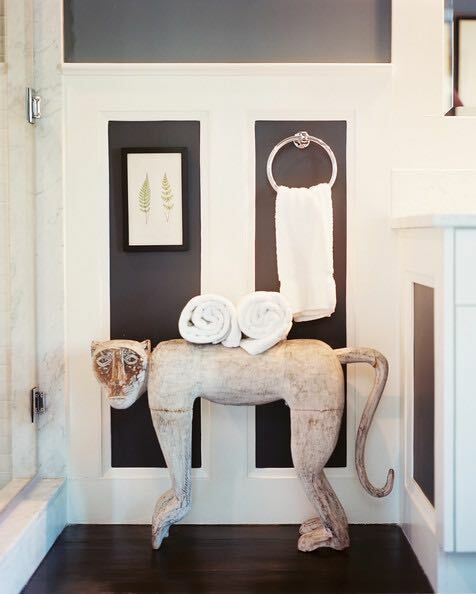 Sometimes, all you have to do is to combine the contemporary bathroom elements with the more traditional ones. 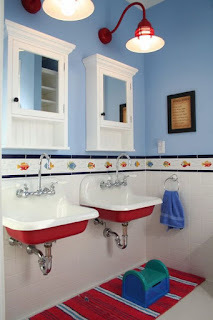 If your bathroom is, for example, predominantly modern looking, you can easily break monotony by simply replacing your bathtub with the good old clawfoot (In that case watch out for any kind of waste - Clawfoots are very prone to blocked drains, and their covers are not always that easy to dismantle). Finally, you can do your future eclectic bathroom a great favor if you just introduce a lot of small details that will completely sell the look you are trying to achieve. So, if you are, for instance, going for the vintage vibe, try to put some old dolls on the shelf or an old gramophone on the table in the corner. Sure, they will serve no purpose whatsoever (unless you have an itch for the vinyl), but they will have to say more about you and the look you are going for than any other large piece. All you have to do know is to do now is to take everything we mentioned into consideration, find out what suits you the best, and unleash your inner designer all over your bathroom. Eclectic style can be achieved even with few small details so do not be afraid to experiment – It will pay off big time.